Chris Davis: Fantasy Post-Hype Sleeper or Bust? The concept of the post-hype sleeper is often bandied about in fantasy baseball circles. But its meaning is vague and even its very existence can be dubious. Most likely, it’s meant to apply to a player that had a pedigree coming up in the minor leagues that struggled upon facing the big boys at some point – and we all moved on. reappear at any time given the right set of circumstances. So once a player shows us his prodigious power or excellent eye or speedy wheels, the argument goes, he can do it again – just give him the right set of circumstances and enough time. We all knew Russell Branyan had big power, for instance; it just took a black hole at first base in Seattle nine years into his career until he got a legitimate shot to launch 30-plus homers in a season. Our own Eriq Gardner has countered the argument, calling it merely the remnants of the hype label being “more sticky than people realize.” He points to one article in particular by Joe Sheehan where he put the label on Felix Hernandez, Jeremy Hermida, Anthony Reyes, Andy Marte, and Zack Greinke. 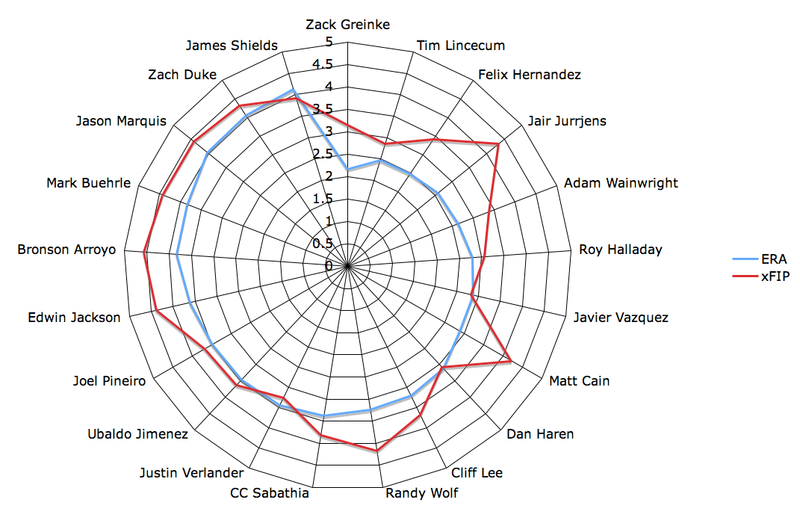 Of course, that wasn’t the year Hernandez or Greinke broke out, and it does show the peril of applying the label, particularly in the case of Hermida. Finally we come to Chris Davis, a player that showed oodles of pop on the way up in the minor leagues (.306/.366/.585 combined AVG/OBP/SLG line in the minors). Davis then exploded onto the major league scene, hitting .285/.331/.549 in his rookie year of 2008. When he fizzled to a .202/.256/.415 start in the first half last year, the hype flew by him like high cheese. Suddenly hype-less, he was sent back in the minor leagues trying to find his mojo. He mashed, was promoted, and mashed some more (.308/.338/.496). 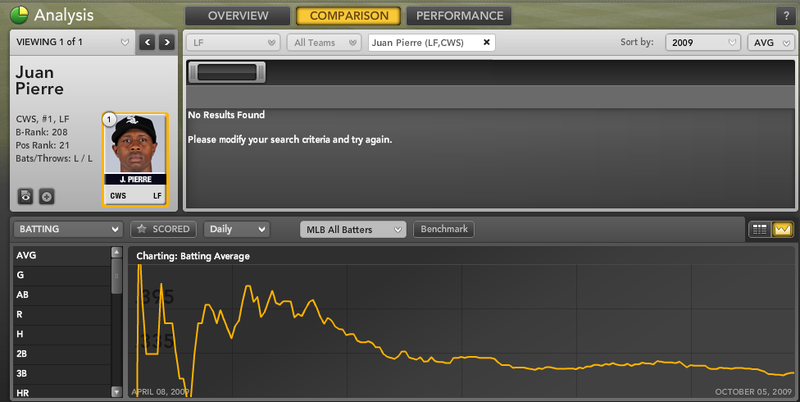 Check the Bloomberg Sports Fantasy Tool for a graphical representation of his slugging percentage by month last year. Roller coaster! So, should we affix the post-hype sleeper label on Davis or not? Definitely maybe. Allow me to explain. In the Shandler corner stands Davis’ power as an example of a skill that Davis has shown and can show again. Throughout the minors, Davis had an ISO (Isolated slugging percentage, or slugging percentage minus batting average) that never once dipped below .257 in a full year; it was a sky-high .279 over 1,345 minor league plate appearances. For comparison’s sake, putting that number up in the majors would land him between Adrian Gonzalez and Mark Reynolds on the power spectrum. Serious artillery there. In the major leagues, that number is still a high .230, with a peak of .264 his rookie year and a very respectable trough of .204 last year. Still, that’s the difference between, say, Nelson Cruz (.264 ISO last year) and Curtis Granderson (.204). Whether he’s got ‘nice’ Granderson-esque power, or light-tower Gonzo power, it seems safe to say that Davis has shown power and owns it. The ride may get a little bumpy though, as we’ve seen. Does the fact that Davis had a .306 batting average in the minor leagues and batted .285 over 295 at-bats his rookie year mean that he ‘owns’ batting average as a skill? That’s tougher to say. Beyond the small sample sizes inherent in using one season’s worth of plate appearances, there’s the fact that batting average is not a skill – it’s a result. The skills that go into batting average are legion. There’s plate discipline, contact, and speed – at the very least. So while Davis’ batting average – the result of these skills – has been divergent, his actual underlying component skills have been relatively constant. Check out the similarities in his two walk rates (a low 6.3% in his rookie year and 5.7% last year) and his two contact rates (a very low 68.1% in 2008 and even lower 63.2% in 2009). Those seem pretty similar, and they point to some serious holes in Davis’ game. 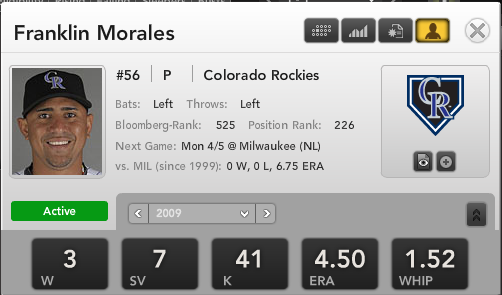 His strikeout rates concur (29.8% and 38.4% respectively). 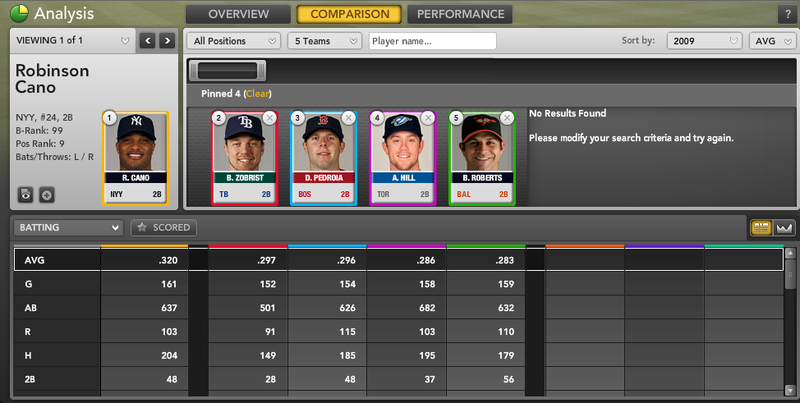 That puts Davis somewhere between Mark Reynolds (38.6% last year) and Mike Cameron (28.7%) on the strikeout scale. If he strikes out that often, Davis will struggle to put up respectable batting averages. A player like Carlos Pena provides you with a hopeful future for Davis, as he has similar contact (69.6%) and strikeout (31%) rates, but he also features a nicer walk rate (13.3%), and that selectivity is important. If Davis doesn’t start walking more, he may just end up like Brandon Inge (8.5% walk rate, 30.2% strikeout rate, 71.7% contact rate and a .230 batting average last year). If power is all you seek, you can call Chris Davis a post-hype sleeper and pick him, although trying to get him closer to his B-Rank (214) than his ADP (172) might still be a good idea. If you are expecting 2008 all over again, you are better off not applying the label and avoiding him altogether. For more information on Chris Davis and other big-whiffing sluggers this year, check out Bloomberg Sports’ fantasy kit for yourself. Bloomberg Sports recently held a fantasy draft featuring six industry experts and six avid fantasy players from different walks of life. For more information make sure to check out the official league site. Reynolds’ projected total of 112 wins. Lawr Michaels of Mastersball.com had the first selection and took Marlins shortstop Hanley Ramirez – one of two players generally accepted in that slot (along with Albert Pujols). He also features a strong set of relievers that project to finish with 100 saves, good for second-best in the league, backed by Brian Fuentes, Rafael Soriano, and Leo Nunez. 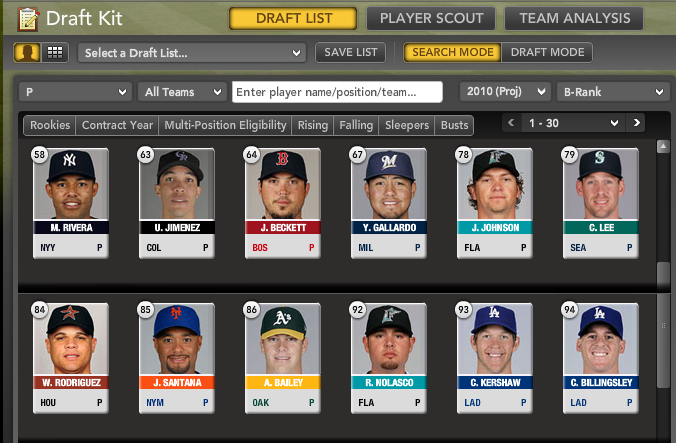 Ron Shandler of BaseballHQ.com jumped on Pujols at number two. He seemingly punted saves though, rostering Heath Bell as his only closer. Shandler is projected at a league-low 53 saves, which is seven saves fewer than the next-lowest team (Gardner). USA Today’s Steve Gardner did a fine job knocking his own efforts. He did manage to grab Ian Kinsler, David Wright, and Andrew McCutchen, as well as promising rookie Jason Heyward. Gardner’s offense is projected to finish with the second-fewest homers, runs scored, and runs batted in. His pitching staff expects to fare better, though, with Cliff Lee, John Lackey, and Rich Harden leading a staff that projects to finish third in wins. KFFL’s Tim Heaney loaded up on top-100 players, particularly those with odd facial hair. Kevin Youkilis, Jayson Werth, and Nelson Cruz, along with the clean-shaven Mark Teixeira, headline the offensive efforts. Heaney’s pitching staff projects relatively weakly, second-to-last in projected wins. Rotowire’s Derek Van Riper loves him some upside. Miguel Cabrera and Joe Mauer are the big names here, and Van Riper also added Ben Zobrist, one of the most valuable players in baseball last year. Some interesting upside picks here include B.J. Upton, Rickie Weeks, and Elvis Andrus, who certainly has the defense to play in the majors, and could see an offensive boost come with age. information on these players and access to the team analysis tool, check out Bloomberg Sports’ fantasy kit. In the first part of our look into the true value of great relievers, we described why great relievers contribute just as much value in ERA and WHIP as starters. Simply put, a fantasy team’s ERA and WHIP is a function of the total amount of earned runs, hits, and walks given up over the total number of team innings pitched. What matters most is finding pitchers who will save a team’s ratios from damage by limiting the number of earned runs, hits, and walks allowed. We showed why the advantage of having great relievers instead of bad relievers is comparable to having great starters instead of mediocre ones, and it’s almost time to explain how one can get a strategic edge by leveraging the full value of relievers. But first, we need to quickly examine two concepts that also play a role in this discussion. The first factor is variability. In Part 1 of the study, we noted that Jonathan Broxton is expected to save eight runs over Leo Nunez, which is not an insignificant number. However, two bad games at the beginning of April where Broxton lets up a couple of unlucky grand slams erases that advantage. Over a long-term period, we can be confident that a player will live up to his skills. 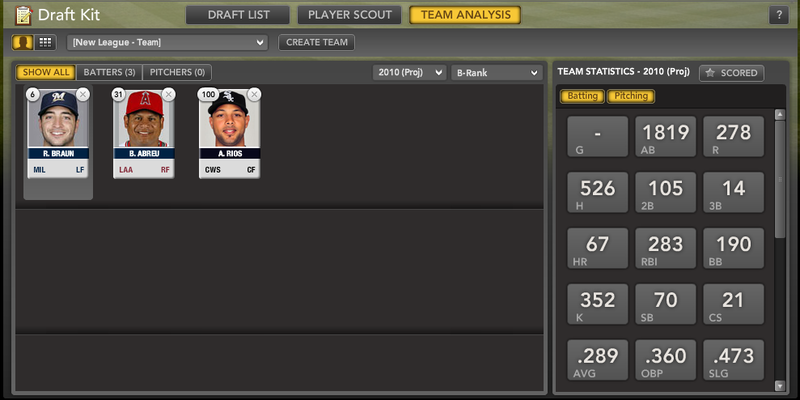 But in a small sample size like 75 IP, how can we safely say that Broxton will come close to his projected 2.76 ERA? 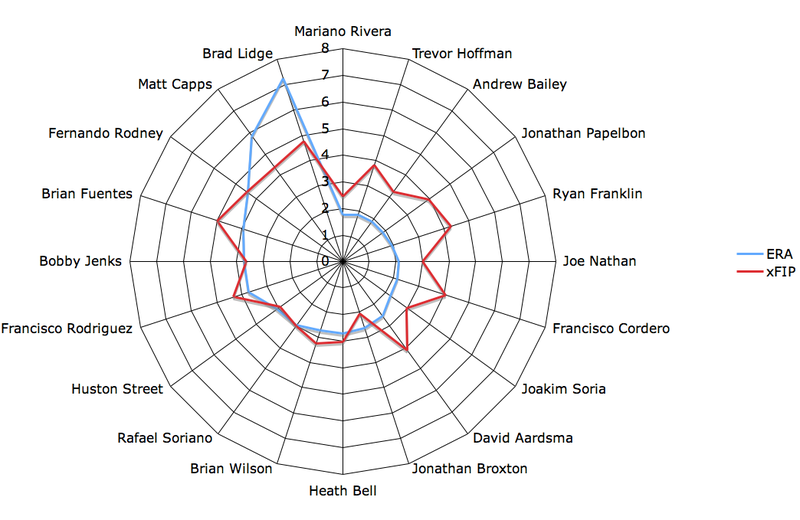 As visual proof, here’s two radar graphs which plot ERA vs. xFIP (a measure of what a pitcher’s ERA should be based on peripheral stats such as strikeout rate, walk rate and home run rate). On the left, you’ll see the 20 pitchers who pitched the most innings in baseball last year. On the right, you’ll see the 20 pitchers who gained the most saves last year. On the left, you see a little variability. On the right, you see a lot. So if we can’t confidently project a reliever’s ERA, should we give up on the idea we should roster them with the expectation they’ll help in the category? The more relievers that a team has on its roster, the more closely the relievers’ ERA in aggregate will match our expectations. For instance, the average difference between the above starters’ ERA and xFIP was 0.51. For the relievers, it was 0.58. Not that big a deal if a fantasy team is willing to invest in several relievers to get the job done. A couple might underperform. A couple might outperform. In total, they should do what we expect. Next comes the concept of scarcity. How much of an investment (via high draft picks) does one have to make on great relievers? And if we need them in bulk to be ensured of having an impact, are there simply too few great relievers out there? It turns out there are quite a few great relievers in any given year, and as you’ll see below, you don’t need to spend much to build a strong bullpen. Players such as Mike Thornton, Mike Adams, Mike Wuertz, Matt Guerrier, George Sherrill, Ronaldo Bellisario, and Jason Frasor all put up an ERA last season that was more than a run under than the league average. They are not alone. Yes, not all are closers, but remember that in our expansive view of the value of relievers, we’ve shown that they provide value beyond saves, and thus, it’s fair to consider middle relievers and set-up men too. In fact, anybody who looks at an in-season player rater (on service providers like ESPN) measuring the real value contributed by players will see quite a number of middle relievers near the top of the charts, largely on the strength of contributions in ERA/WHIP. Last year, for example, Wuertz was roughly the 38th most valuable pitcher in 5-by-5 roto leagues, ahead of solid closers like Francisco Cordero and good starters like Ryan Dempster. Of course, fantasy teams need closers too, because saves do count. So now we start getting into the best strategy for rostering relievers via draft. When looking at pitchers in general, we want to focus foremost on underlying skills — the ability to strike out batters, the ability to have control and limit walks, and the ability to limit damage by preventing line drives and home runs. A pitcher who displays these skills can be expected to save earned runs, hits, and walks over the long haul. Some relievers such as Broxton, Mariano Rivera, Joakim Soria, and Heath Bell do all these things extraordinarily well and deserve a premium because of the added contributions they make in the saves category. It’s perfectly reasonable to select them high in drafts because they are providing strong value in ERA/WHIP plus racking up numbers in the scarcest of categories — saves. There are other closers out there, including Frank Francisco and Chad Qualls, who also sport strong peripherals, but might get discounted because of perceived job insecurity. In the middle rounds, each makes a good target. Anybody reading closely at this point might wonder about available roster room to gather all these relievers. Rostering depends a lot on context. The more roster spots per team in a given league, the more available room for relievers who will provide help in ERA/WHIP. 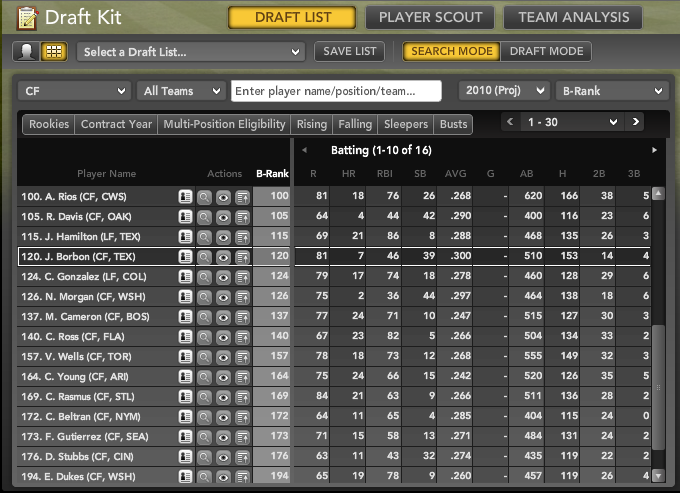 A smaller bench might mean not as much opportunity to draft a heavy load of relievers. That said, teams that acknowledge that late-round relievers can provide as much value in ERA/WHIP as early-round starters can use their biggest investments not on starters, but on stable hitters who won’t require back-ups, nor replacements. Having a team built upon stellar relievers saves high draft picks for a killer offense, which then saves bench room for more pitchers. 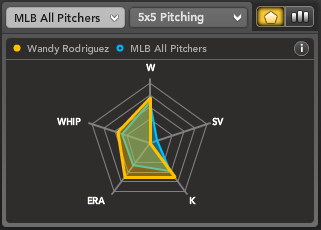 s — mixing in some mid-to-late round starters with great strikeout rates such as Jonathan Sanchez and Jorge De La Rosa — can compete strongly in the category of strikeouts too. What this all adds up to is the prospect that one can take advantage of a market inefficiency based on the wrongful assumption that relievers don’t contribute much value beyond saves. It turns out they go a long way to helping a fantasy team do extremely well in four of five pitching categories, at an amazingly cheap investment. By correctly leveraging relievers, fantasy teams can relax on starting pitchers and focus on winning five offensive categories. This is extremely enticing. What’s the real lesson here? Perhaps it’s that the true value of great relievers lies in the fact that most people don’t recognize their greatness. 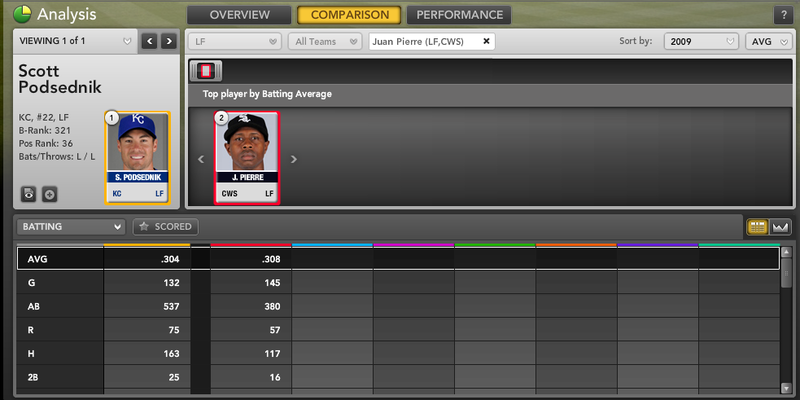 Scott Podsednik and Juan Pierre are eerily similar. The pair of early-30s outfielders share a division, an affinity for high socks and grit, past or present homes in Colorado and the south side of Chicago, and the ire of the sabermetrics community. They also own the same career OPS (.720). But it’s the two players’ ability to swipe bases which them interesting, if unheralded, options in most leagues. Podsednik is coming off a year in which he hit seven homers in 537 at-bats. That qualifies as a power spurt; Podsednik had hit six homers in his previous 1,407 at-bats. He also hit over .300 for the first time since 2003, his breakout season with the Brewers. Don’t expect a repeat of that feat either. He’s still a strong stolen base threat, though, especially if he sticks in the Royals’ everyday lineup. After swiping 30 bases last year, Manager Trey Hillman has Podsednik penciled in as the starting left fielder and plans to give him the green light to run often. Podsednik’s B-rank of 321st is accompanied by a projected line of .277, three homers, and 20 stolen bases. An average draft position of 326 suggests the market for his services is just right. With Jose Guillen shunted to DH, Podsednik winning the confidence of his manager and his speed holding up, though, 500-plus at-bats and another season of 30-plus steals could happen – which would bump up Podsednik’s value substantially. Meanwhile, Pierre will man left field on the south side of Chicago. B-Rank enjoys the faux Frenchman’s abilities far more than Podsednik’s, and ranks Pierre 208th with a projected line of .296, a single homer, and 32 steals. Considering Pierre is coming off a season in which he went on a hot streak in Manny Ramirez‘s absence, there’s a chance someone will overdraft him; in fact, his average draft position is at 196. That’s a slight overdraft, although acceptable if you draft power early and are looking for a late-round speed threat. It’s important to note that these players are undervalued because their flaws are well-established in real world analysis. Both Podsednik and Pierre are woefully short on power, especially playing corner outfield spots, where teams typically target far more prolific offensive players. But in fantasy baseball, both could be good targets. In fact, if your fellow league members are sabermetrically savvy, Podsednik and Pierre could be terrific win-ugly value plays. For more information on Juan Pierre, Scott Podsednik, and other draft day sleepers, check out Bloomberg Sports’ fantasy kit. Much has been written on this site about finding cheap steals in your draft. We’ve profiled players such as Drew Stubbs, Cliff Pennington, Cameron Maybin, and Everth Cabrera. Another player to consider adding for that list is the Texas Rangers’ young center fielder, Julio Borbon. After being selected in the first round of the 2007 draft, the speedy outfielder began his first full season of professional ball with the Rangers’ High-A team in 2008. He hit .306/.346/.395 (AVG/OBP/SLG) and stole 36 bases in 314 plate appearances, confirming his profile as a speedy, high-average hitter with little power. Promoted to Double-A, Borbon hit a robust .337/.380/.459, with 17 more steals in 217 plate appearances – giving him 53 stolen bases between the two levels that year. Those numbers prompted the Rangers to promote the then-23-year-old to Triple-A at the start of the 2009 season. Facing his toughest competition to date, Borbon continued to put up strong numbers, hitting .307 and getting on base at a .367 clip. Although Borbon stole only 25 bases at Triple-A, his patience at the plate showed improvement; his walk percentage climbed to 7.2%, the highest of his three minor league stops. The low ranking in AB, H, and R is expected due to his late call-up. But given a full season, Borbon projects for strong numbers in these categories. 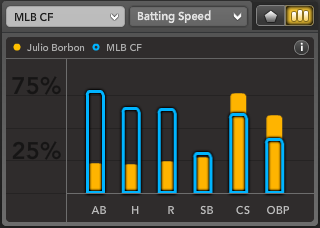 You can see Borbon compares favorably when you look at his SB (19, compared to the average of 21), CS (4, 7) and OBP (.376, .344) – again, in just 179 PA. Bloomberg Sports projects Borbon to post a .300 AVG, .357 OBP, 39 steals and 81 runs scored in 2010. The Rangers are giving Borbon every opportunity to win the center field job this spring, not wanting to run Josh Hamilton out there for a third season and risk him getting injured once more. If Borbon wins the center field job, he’ll likely lead off, which would give him an opportunity to beat Bloomberg Sports’ already optimistic projection: Getting on base in front of hitters like Hamilton, Ian Kinsler, Michael Young, and Nelson Cruz should provide Borbon ample opportunity to showcase his excellent speed and potentially even approach 100 runs scored. Bloomberg Sports’ B-Rank projects Borbon as the 14th-best center fielder in MLB in 2010, ahead of better-known players like Nyjer Morgan, Vernon Wells, and Carlos Beltran to name a few. Those players, and others of the same ilk, might get picked ahead of Borbon in many leagues based on name recognition alone. 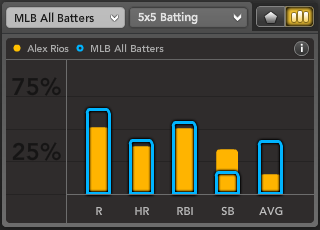 That’s a perfect formula for landing one of the best sleeper names in fantasy baseball this season.